Billboard.net's Quick Win Portlets can instantly enhance any intranet portal. Installation is a snap -- try them out yourself for free. There's no easier way to add useful, dynamic content to a 10gAS driven portal. The Todo List Portlet has been created to work as a JSR-168 compliant portlet.r industry and technology expertise long after we've rolled off your current project. The Weather Portlet has been created to work as a JSR-168 compliant portlet. 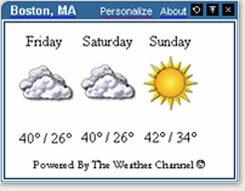 It can be customized to display local and national weather.